so I rest almost all day. It was so annoying pain. I have today to share this card. This card was sent to very dear friend. Simon says wednesday challenge 08.08. Simon says monday challenge 06.08. 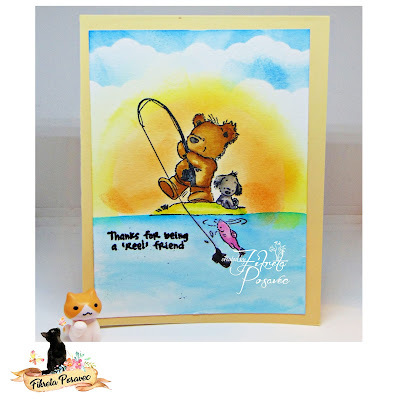 Cute card thursday challenge 08.08. Gorgeous card with a great background. Hope the pain in your eyes has gone! Glad you are feeling better, my friend! I hope your eyes will be okay! Your card is adorable! Enjoy your weekend! This is so darn cute and love the adorable images. A super card Fiki, such a cute image and lovely scene. I hope you feel better, Fiki! Your card is so cute! Sweet and delightful card...hope your eye is better today..hugs. Fiki, this is adorable. Love your coloring. How fabulous - great colouring on the sweet image and the whole background colouring is wonderful :-) I do hope your eyes are feeling better today Fiki !!? Such a lovely creation! Love the colors! That bear is the sweetest and you have made a stunning sunset. Thank you so much for joining us at Simon Says Stamp Wednesday Challenge -- Good Luck!